We offer a superior quality range of Sequential Timers, which are used for dust collector systems as well as bin stimulators. These products are high famous for their long service life and are available in various specifications in terms of shapes, sizes, capacity and voltage. 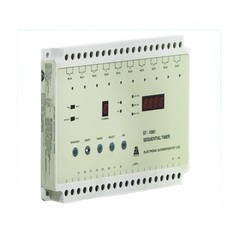 Our organization is engaged in offering a high performing range of Sequential Timers -Model ST-4M1, which is manufactured at par with latest technological advancements. 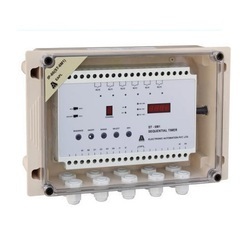 These Timers function with four channels in different voltage range and provide accurate results. Our range is available at industry leading prices and can be delivered within the stipulated time frame. 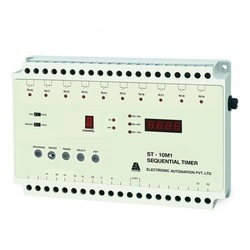 We hold expertise in offering a quality range of Sequential Timers - Model ST-6M1, which has micro controller based design. 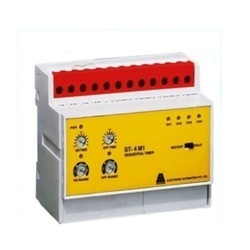 These are also equipped with program & process value retention incases of power failure and also has external contacts for timing initiation & timing pause. The extensive range of Sequential Timers - Model ST-10M1 offered by us is manufactured in line with set industry standards. These multiple units can be used to obtain more channels and the program & process value retention is also possible incase of power failure. 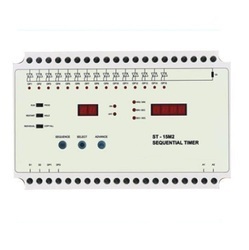 We offer these Timers in various technical specifications as per the details provided by our clients. User friendly programming for On/Off time selection up to 99 hrs 59 mins. 7 segment display indication for channel & timing operation. Multiple units can be cascaded to obtain more channels. Program & process value retention incase of power failure. Looking for Sequential Timers ?